In his four days tour to Chiang Mai and Chiang Rai Province in Thailand which concluded on Friday, Deputy Chief Minister of Arunachal Pradesh, Chowna Mein part from overseeing important agreements on educational and research exchange programmes with two famous Universities in Thailand, he also visited famous 101 Tea Plantations at Doi Maesalong from where high qualities Oolong Tea are produced. The 101 Tea Plantation is a world famous terrace tea plantations located at some 850 metre above Sea Level at Doi Maesalong some 2 hours drive from Chiang Rai main city. Three types of high quality Oolong Tea are produced in this Tea Plantation both for domestic and over sea supply. The local girls in the tea estate in their beautifully decorated vendors demonstrate the visitors about the preparation of three different types of Oolong tea and explained their medicinal values too. Mein accompanied by his Thai friend, Thanapat Choompolsil, Vice-Presdient of Human Resource & Administration, Unimit Engineering Public Company Limited, Thailand, President of Arunachal University of Studies, Dr Ashwani Lochan and others also visited the Processing Units of the Tea Plantation. He advised Dr Lochan to explore possibilities of courses in the Tea Plantation to the student of Agricultural sciences who would be sent for study in Maejo University at Chiang Mai. Mein also visited the famous White Temple at Chiang Rai known as Wat Rong Khun. The Temple is a contemporary, unconventional, privately owned, art exhibit in the style of a Buddhist temple in Chiang Rai Province, Thailand which is a centre of tourist attractions. 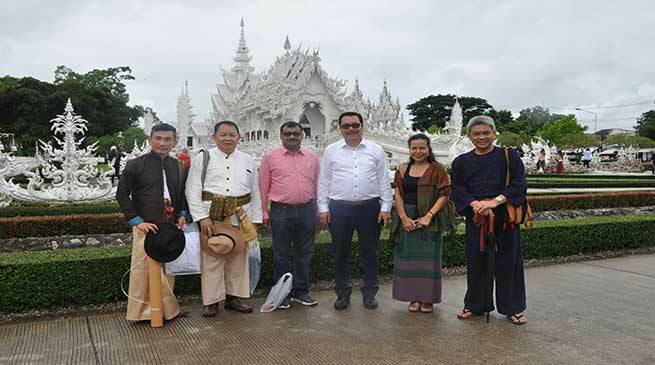 He interacts with the architects of the magnificent Temple and invited them to come to Arunachal Pradesh in India and design similar types of temples which can be built for tourist attractions in the state too.